PreCO is a 4 columns Responsive WordPress theme by MagPress. 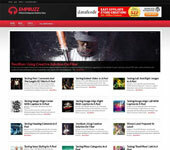 This theme is HTML5/CSS3 ready. The combination of White, Red and Blue colors making this theme suitable for use on medical, fashion and many other niche blogs. PreCo theme also comes ready with built-in features such as featured posts slider, featured categories (multiple usage), social buttons, and many more. Feel free to check out the demo. Thanks.